‘What it’s all about’: Team Semper Fi brings vets to Keystone Adaptive Center… on Krystal 93 news – February 12, 2019. 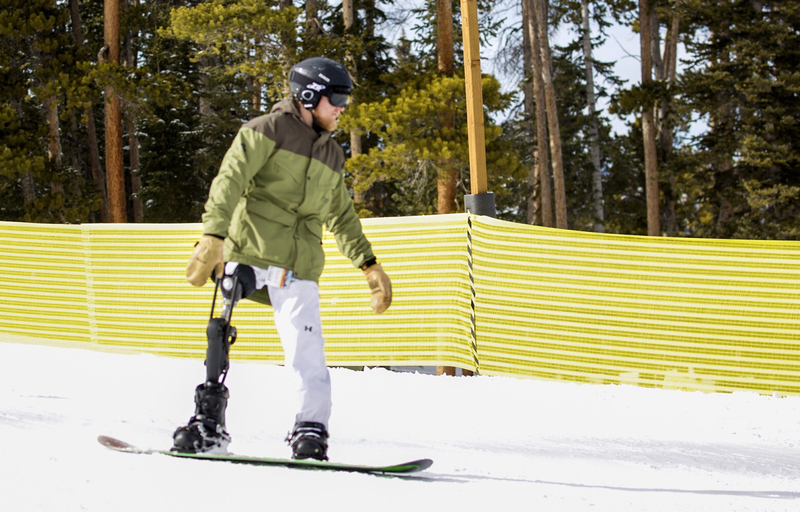 U.S. Paralympics, a division of the U.S. Olympic Committee, and the Breckenridge Outdoor Education Center (BOEC) have partnered to create Paralympic Sport – Breckenridge. Paralympic Sport – Breckenridge is a community-based sports club developed to involve youth and adults with physical and visual disabilities in sports and physical activity, regardless of skill level. All programs and activities will be based in Breckenridge and run by the BOEC. “U.S. Paralympics is dedicated to creating opportunities for individuals with physical and visual disabilities to be physically active in their own communities. Participation in physical activity enhances not only self-esteem and peer relationships, but also results in greater achievement, better overall health and higher quality of life.” — Mike Mushett, U.S. Paralympics Director of Community Programs. With 21 million physically disabled Americans, including thousands of military personnel who’ve been severely injured while on active duty, this is an important community need. The BOEC was established in Breckenridge, Colorado, in 1976 as a non-profit tax-exempt educational organization to provide outdoor experiences for people with disabilities and to train the instructors who work with special populations. Ultimately, the BOEC strives to integrate disability with ability, providing outdoor experiences to all. We welcome people of all abilities from around the world to spectacular natural classrooms in the Rocky Mountains and beyond. U.S. Paralympics is committed to working with community organizations across the United States to create 250 Paralympic Sport Clubs by 2012. For more information about the BOEC and Paralympic Sport – Breckenridge, please contact Marci Sloan at (970) 453-6422 or marci@boec.org. For more information about U.S. Paralympics, please contact Susan Katz, (719) 866-2068 or susan.katz@usoc.org. About U.S. Paralympics: U.S. Paralympics, a division of the U.S. Olympic Committee, is dedicated to becoming the world leader in the Paralympic sports movement and to promoting excellence in the lives of persons with physical disabilities. Visit the U.S. Paralympics website at www.usparalympics.org. About BOEC: For more than 30-years, the Breckenridge Outdoor Education Center (BOEC) has provided life changing outdoor learning experiences to people of all abilities, with a focus on those with special needs. The BOEC provides a sense of freedom to those who are routinely excluded from activity due to a disability or special need. Whether skiing in the Adaptive Ski and Ride Program at Breckenridge or Keystone Ski Resorts, paddling the West’s great rivers, or mastering the Ropes Course, the BOEC inspires people of all abilities to discover new places, learn new skills and rekindle their spirit in the heart of the Colorado Rocky Mountains. The Breckenridge Outdoor Education Center provides alpine skiing and snowboarding lessons to people with disabilities and other special needs at Copper Mountain Resort. Lessons are conducted on a personalized, one-on-one basis, and include all instruction, on-hill guiding and support, specialized equipment and lift ticket. All disciplines of adaptive skiing are provided, including four-track, visually impaired, three-track, mono-skiing and bi-skiing. Prices above are per person. Customized lessons for groups are available upon request. Payment in full is required to confirm reservations. Please call (970) 453-5633 or 1-800-383-BOEC to make a reservation. It is recommended that reservations be made as soon as possible, as we have limited capacity and our lesson days tend to fill quickly. Please also feel free to contact us via email at skiprog@boec.org. Since 1976, the Breckenridge Outdoor Education Center has been providing empowering outdoor experiences to people of all abilities. The Center offers adaptive ski programs and adaptive outdoor education camps at a campus in Breckenridge and wilderness programs throughout Summit County and the region. Activities are available year round and include skiing, snowboarding, ropes course, challenge activities, rock climbing, river rafting, canoeing and many others, all adapted to be accessible to all abilities. KEYSTONE – As U.S. Army veteran Scott Winkler boarded Keystone Resort’s Montezuma Express lift on Saturday, the chair stopped and a bell rang. “It wasn’t me,” he yelled, grinning. At 237 pounds, the disabled veteran is a hulking monoskier. But the professional athlete was already in position for take-off by the time the cautious lift operator halted the chair. 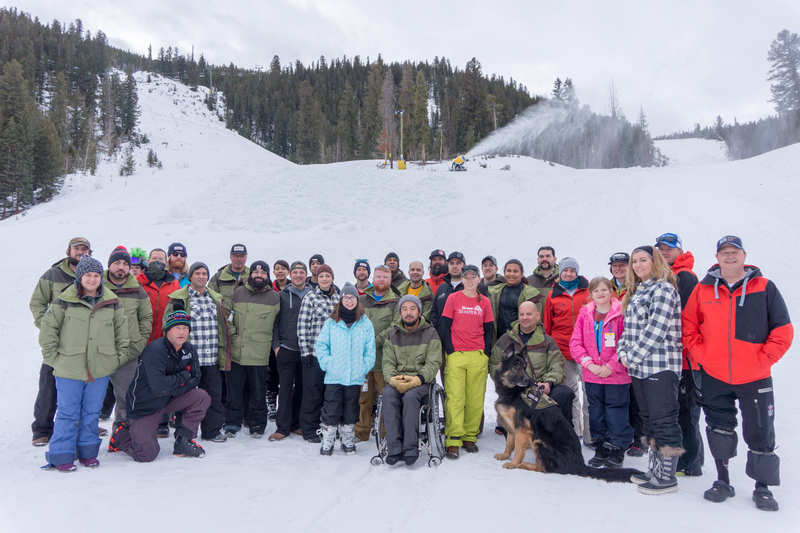 Winkler and 16 recently wounded military veterans were wrapping up a four-day adaptive ski and ride camp at the resort as part of Snofest. The Breckenridge Outdoor Education Center and Adaptive Adventures partnered to provide lessons to the veterans and their guests. Winkler, 36, lost the use of his legs after a spinal-cord injury in Tikrit, Iraq – Saddam Hussein’s hometown. The American soldier was serving in the first advance of Operation Iraqi Freedom in May 2003. The metal strap for securing the ammunition was caught on his boot as he lifted a 65-pound box of fragmented grenade-launcher rounds. “If the box hit the ground, everybody would have been in trouble,” he said, adding that it likely would have exploded. “They’re young and they have good core strength,” he said. “They don’t have much of a morale issue – as opposed to a drunk driver victim or a victim of a disease. Barker said getting on the chairlift is often tougher than riding for the disabled soldiers. Matt Feeney, also of Adaptive Adventures, is a monoskier who’s been instructing others for 18 years. The Snofest is in its 19th consecutive year. It’s offered by regional military installations to all active military and their families. The participants enjoy a weekend of skiing, and other off-mountain events, and more than 4,000 attended last year, according to a BOEC press release. 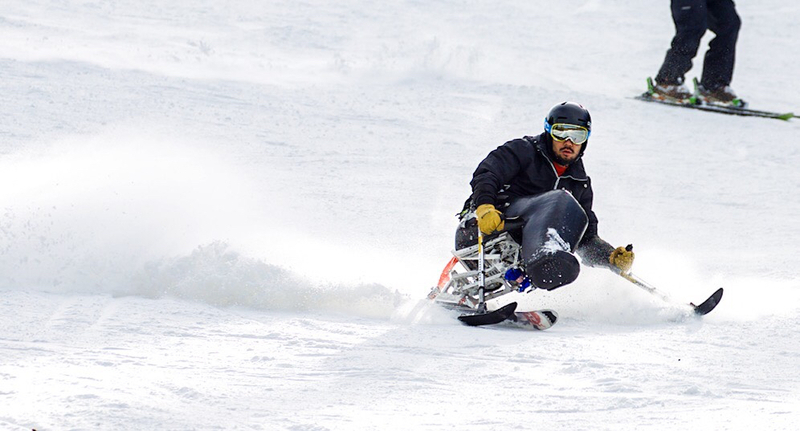 This is the second year for the adaptive ski and ride component. It provides lodging, transportation, meals, equipment and more for the disabled veterans. Funding for the adaptive camp comes mostly through the Wounded Warriors Disabled Sports Project, the Scotty McFadden Foundation and Boeing. Saturday was Winkler’s 10th on the slopes since his injury. When he’s not competing in world-class events, the veteran from Augusta, Ga., is vice chair of a nonprofit dedicated to activities for people with disabilities. Champions Made From Adversity brings people who have disabilities – and their families – water skiing, hand cycling and even scuba diving. Following his injury, the Winkler said he didn’t do much. He spent some time fishing before getting into wheelchair basketball. Then he went to a military sports camp in Colorado Springs “and it just kicked off from there.” He went on to become the first Iraqi War veteran to join the U.S. Paralympic Team. Winkler also competes in shot put and discus, and has broken both American and world records. Last year he competed in the Beijing 2008 Paralympic Games, ranking fifth of 17 in his field events. “Just because you’re disabled, it’s not the end of the world,” he said, adding that he’s preparing for the 2012 Paralympics in London. The soldier-turned-athlete, who has even appeared on a box of Cheerios, uses his story to encourage others. BRECKENRIDGE — When Englishman Dan Hallam left school eight years ago at 16, he fell straight into sailing instruction near his home. At 18, he went abroad to teach sailing and wind-surfing in Greece, Egypt and the Caribbean. According to Hallam, sports kept him on track and helped him through school. Because of his own struggles with dyslexia, he sees athletics as a method to help people overcome disabilities. And when he lost his finger in a sailing accident, he decided to pursue outdoor education as a career. Hallam, who’s originally from the London-area, is now a 24-year-old Breckenridge Outdoor Education Center intern. He’s recently worked in the UK as a multi-activity instructor, teaching climbing, cycling and mountain biking, as well as other activities. But, when he found the BOEC intern program online, he jumped at the opportunity to work with special-needs clients. Hallam loves the work and hopes to be a full-time instructor with BOEC next year. getting them ready to go for the day, transportation, ski instruction, dinner, tidying up and evening entertainment. “You stay the night and start again the next day,” he said of his experiences acting as a caretaker and an instructor for clients with disabilities. On other days, interns can also be found working in the ski office in all capacities. As an intern, Hallam lives in a house shared by 11 other interns. The BOEC provides food and shelter, but the internship is unpaid. None of the interns have extra jobs. They work 8 a.m. to 4 p.m., so savings is required to make the position work. Days off vary each week depending on need. BOEC interns spent the month of November training to be adaptive-ski instructors. Hallam has worked with both tethering and monoskiing. “It was pretty intense,” he said of his training. Now all 12 interns are full-fledged teachers who are available daily to help with lessons. And all the interns — two Australians, nine Americans and Hallam — seem to want to follow the outdoor-education path, he said. Hallam said the seasonal internship program is helpful because it teaches necessary problem-solving skills and versatility in the workforce. The BOEC, a nonprofit educational organization, was established in Breckenridge in 1976 to provide outdoor experiences for people with disabilities and to train the instructors who work with special populations. The BOEC strives to integrate disability with ability, providing outdoor experiences for everyone. The nonprofit hosts people of all abilities from around the world to experience spectacular natural classrooms in the Rocky Mountains. For more information about the internship program, visit www.boec.org.